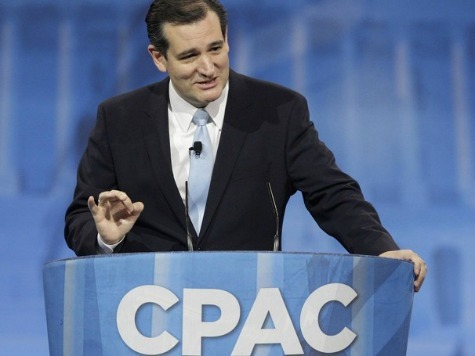 NATIONAL HARBOR, MARYLAND–Texas’ junior senator Ted Cruz delivered an impassioned speech as the opening speaker for the annual CPAC gathering this morning. His remarks focused on two major areas; elections and the young people of America. The Senator concluded his remarks by discussing his new proposal for an American Energy Renaissance. This proposed legislation was the topic of an exclusive Breitbart Texas interview in February. The Senator outlined a positive agenda that includes increasing high-paying jobs in the energy sector, repealing Obamacare, expanding school choice, abolishing the IRS, ending welfare for corporations and auditing the Federal Reserve. Cruz even touched on the politically sensitive issue of term limits. CPAC is an annual gathering of conservative political activists. The conference opened today and will continue through March 8. Other scheduled speakers from Texas include Sen. John Cornyn who just won the Republican nomination in his re-election bid and Texas Governor Rick Perry. Gov. Perry will address the audience at 9 a.m. (EST) on Friday. Perry will be followed by Sen. Cornyn who speaks at 9:15 a.m. (EST). A live-stream is available courtesy of Breitbart TV.